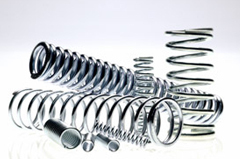 Kansas Coil Spring Company has been producing the highest quality and certified aviation springs and wire forms in Wichita for over 30 years. Collectively, our staff has over 100 years experience in the manufacturing field. Our staff at KCSC offers complete services and technical support, from engineering and design assistance, to manufacture and delivery. KCSC manufactures parts to the highest standards for a wide array of industries including, but not limited to: aircraft, agriculture, oil, and the U.S. Government.